1. Dig the hole – Dig three times wider than the root ball. That will make it easier for the tree to put out new roots rather than make them drill through compacted soil. 2. Watch out for the root collar – Planting the tree too deep is a common problem. Every tree has an area a couple of inches above the roots called the root collar. If the tree collar is buried, the tree will suffocate. 3. Water twice a day for the next five months – Plan for two to three gallons for every inch diameter. Measure the trunk about six inches above the ground. Then for the rest of the year, water once a day. 4. Avoid Sprinklers – Use a hose, not the sprinklers. "Trees don't like 'em." Routinely wetting the trunk creates conditions that cause fungus and that can kill the tree. The same thing can happen by putting flower beds up against the trunk. 5. Hold off on the fertilizer – New trees can't handle it and a healthy tree really doesn't need it. Instead, the best thing to do is to re-create the forest floor around the tree with mulch and small plants. The natural decomposition will feed the tree. The tree also will be fed if you fertilize your lawn because the root systems of trees in a typical yard crisscross and intertwine under the grass. 6. Avoid weed killers – You can slowly kill a tree by using a weed killer on your lawn. "They contain atrazine, which kills broad-leaf plants. And many trees are broad-leafed plants." Early says. Every time you apply a weed killer to your lawn, you kill off about 5 percent of the tree roots. The tree can grow back only about 3 percent a year. So, over time you slowly kill the root system. "I get people who call me up and say, 'Early, my trees look awful, but my lawn looks great. What's wrong'?". 7. 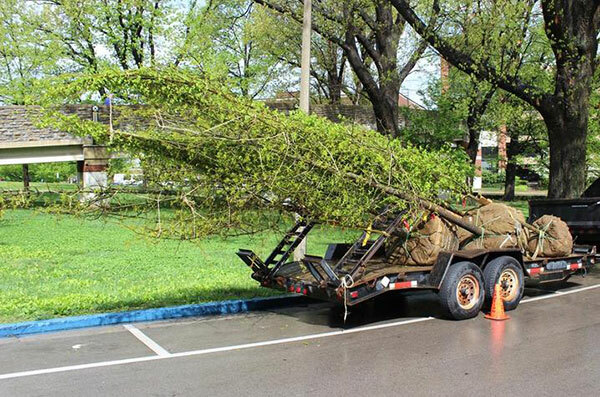 Protect roots – Driving, parking or storing heavy loads under trees isn't good for the root system either. Some roots are as fine as a hair and are easily crushed. 8. Think ahead – Select and place trees based on their mature size. A tree that grows to 40 feet shouldn't be planted next to a house or under power lines, for instance. A bushy tree shouldn't be planted near traffic or street signs. 10. Plant for Flowers – Consider redbud, tulip, poplar, crepe myrtle, flowering dogwood or Southern magnolia. 11. Planting Season – Planting season is considered optimal in January and late winter before the growing season begins. 12. Another Resource – is the Floriuda Urban Forestry Council at www.fufc.org, which offers the Right Tree, Right Place Planting Guide ($7) with a version for North Florida.